After pickup from your Miami Beach hotel, travel the beautiful Overseas Highway from Miami to Key West. 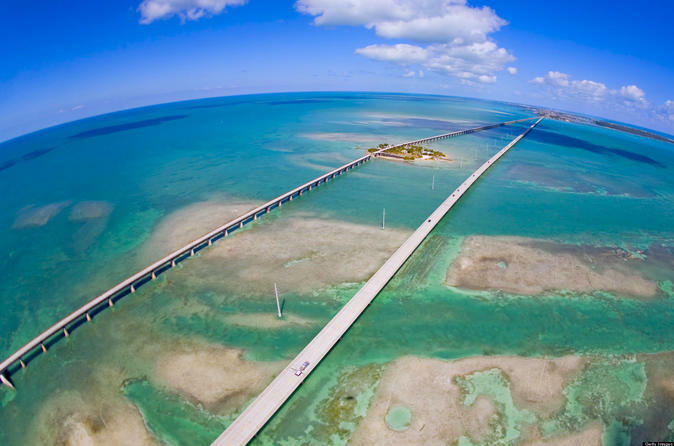 On the way, pass over 42 islands including Key Largo and cross numerous bridges including the Seven Mile Bridge. Listen to your guide share facts and anecdotes about the Keys and their distinctive character. Reach Key West before noon and spend at least 5 hours independently discovering this mellow, scenic island, visiting museums or participating in activities at your own expense. Check out the old Victorian house where writer Ernest Hemingway once lived and penned some of his most famous works, and visit his favorite bar, Sloppy Joe's. Learn more about Key West's history at the Mel Fisher Maritime Museum, and see the buoy just 90 miles (145 km) from Cuba that marks the southernmost point of the United States. If you're looking for a more active afternoon, try snorkeling in the clear, vibrant waters off Key West. Your 15-hour adventure ends with your return journey over the Overseas Highway and drop-off at your Miami Beach hotel.